So . . . the time is ‘nigh on one hundred years ago, the setting is a lumber camp deep in the woods of the upper Midwest, and four lonely lumberjacks seeking solace in music are tossing a coin to see which one of them has to take the female part as they dance the do-si-do. 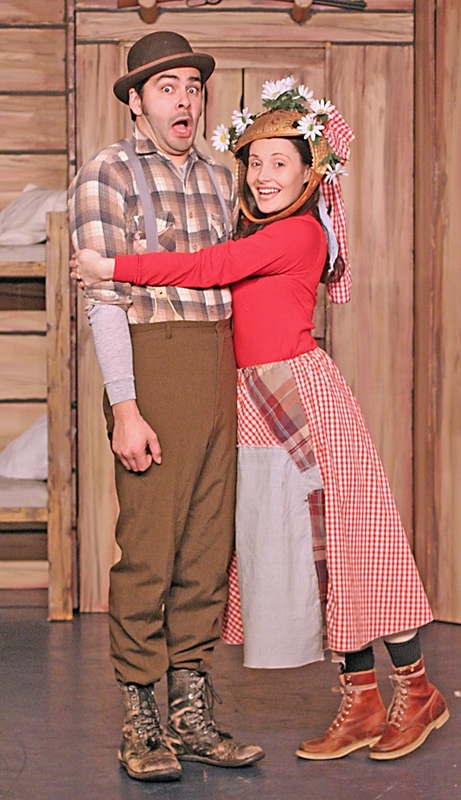 The opening scene of “Lumberjacks in Love” is a classic set-up for the complications of love and the yearning for companionship that the gifted actors of The Great American Melodrama explore with wit and more than one wink to the audience. It’s a pleasure to see tongue-in-cheek fare presented in a way that truly connects with a crowd – and at a pace that seldom lets audience or actors pause for breath. Going into this production, director Eric Hoit must have decided that every second on stage counts; there are more jaunty tunes and shindigs than you can shake a stick at in the course of this tale’s nearly two hours. There’s no shortage either of double entendres, malapropisms, knowing looks, swats from scrub brushes (baths are a once-a-week occurrence in lumberjack-land), misunderstandings about mail-order brides, and complicated bits of physical comedy that pay off in laughs every time. The only thing in short supply in this lumberjack-land is women. Hence the dilemma of Muskrat (Chuck McLane) as he faces his 40th birthday alone, the complicated attraction Moonlight (John Keating) feels for The Kid (Katie Worley), and the mishap resulting in the arrival of the mail-order bride (Bree Murphy). McLane, Keating, Worley and Murphy are all in outstanding form as they express fun, frustration and finesse in their roles. Minnesota Slim (George Walker) and Dirty Bob (Billy Breed) round out the quartet of lovelorn lumberjacks, but these two characters are a little less interested in current romance than they are in love lost long ago. The bits of truth revealed in the funny but pointed performances by Walker and Breed remind us that a bit of blue soap (it’s been 32 years since Dirty Bob’s last bath), or even a mis-directed bride, might change your life. 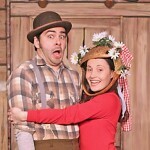 It might be tempting to dismiss “Lumberjacks in Love” as a one-dimensional comedy just out for laughs, and indeed this production’s washtub brigade singing three-part harmony with accompanying percussion may forever erase Monty Python’s “I’m a lumberjack and I’m OK!” from your mind. However, the program notes acknowledge the American Folklore Theatre in Wisconsin and creators Fred Alley and James Kaplan, who deserve credit for building an enjoyable musical with origins in American folk culture. Musical director Jordan Richardson energetically interprets Kaplan’s music, and his accompaniment is flawless. Richardson is a treasure that Melodrama audiences may overlook because his talent doesn’t draw attention to itself but instead seamlessly showcases and supports the talents of others. And speaking of seamless, the scene changes during the show from cabin to woods and back again are nothing short of amazing, taking no time at all yet completely changing the set. Kudos to stage manager Jim Shine for making it work. Making a scenic and time period leap from lumberjack camp to Las Vegas, the Melodrama follows “Lumberjacks” with its “Viva Las Vegas! Vaudeville Revue” capturing the ambiance of the ‘60s and ‘70s with gold bow ties, ruffled shirts and bouffant hairdos while parodying the likes of Dean Martin, Frank Sinatra and Ann-Margret. In the “Behind the Scenes” department, the technical design by Gary Adams for both “Lumberjacks in Love” and “Viva Las Vegas” is theatrical magic. Don’t miss it! There’s still time to catch the show, which runs through April 25. Visit the CalCoastNews Community Calendarfor details.